Anton Krupicka smashed the FKT on September 18, 2012: 8h46m32s car-to-car (from Green River Lakes). Previously the FKT was held by Peter Bakwin (August 1, 2009) at 12h39m29s car-to-car, 7h00m car-to-summit (from Green River Lakes). And, Andy Dorias set the previous ascent record on August 26, 2011, 6h30m from the Elkhart TH, with a slightly slower RT time of 12h45m55s. 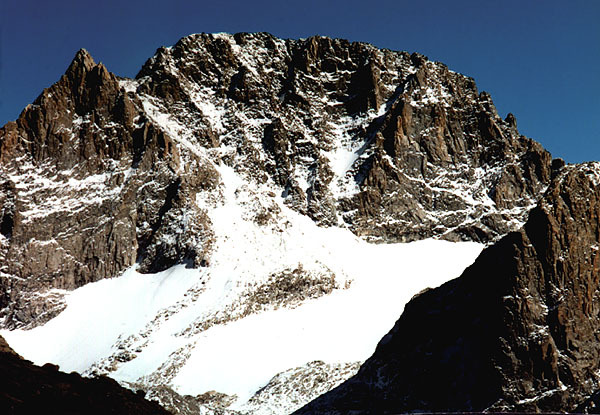 Gannett Peak (13,804') is the highest peak in Wyoming. Lying deep within the Wind River Range, it is surely one of the most difficult of the 50 state high points due to long approaches and tough climbing. Most often, Gannett is approached from the south via the Titcomb Basin / Bonney Pass route (40 miles round trip), or from the northeast, via the Glacier Trail (50 miles round trip). Though the Glacier Trail route is longer, it allows for a shorter summit day for most parties. Gannett is seldom climbed in a single day. An early speed record was by the legendary Chris Reveley, who posted 17h48m round trip via Bonney Pass. I have confirmation of this from Reveley, but so far have not been able to get details, and don't know the date of his trip. He climbed from Elkhart Park via Dinwoody Pass. Buzz Burrell and I wanted to climb Gannett in a day, but we didn't relish the long approaches of the usual routes. Looking at a map of the area, we determined that an approach via the Highline Trail from Green River Lakes would be shorter, probably about 36 miles round trip. Two drainages allow access to the Gannett's west face from this direction, Tourist Creek and Wells Creek. Wells Creek is the most direct, but the map clearly shows several contours coming together near 10,200' in the drainage, a feature known ominously as "The Cleft". Throwing caution to the wind, Burrell & I gave Wells Creek a shot on August 8, 2004. We found a wonderful, challenging, beautiful route, with a crux pitch in the Cleft that required some exposed 5.6 rock climbing. After floundering around in the Cleft, and enjoying a blue-bird day, we reached the summit in 9h40m, and completed the round trip in 18h15m, not quite matching Reveley's record. Our trip report and photos are here. The Wells & Tourist Creek routes join above the Cleft, and then ascend Minor Glacier to gain the north ridge of Gannett. Minor Glacier has been studied by Mauri Pelto of Nichols College, and is in retreat. On a glaciology blog Pelto writes "Minor Glacier on Gannett Peak in the Wind River Range of Wyoming is truly minor compared to when its name was given. The glacier has retreated about 500 m since 1966, which was 35% of its total length. The east side of the glacier is nearly gone. The area has been reduced from 0.87 to 0.26 km2 in the last 50 years." Perhaps inspired by our trip, Dave Anderson did a speed ascent of Gannett in September 2006 via the Green River Lakes approach (probably Wells Creek), making the summit in 8h20m, as reported on climbing.com. I do not know Anderson's round trip time. Anderson said "I bonked really hard on the run back, I even laid down on the trail and slept for a while, thus the slow car to car time." While not fully aware of the exact FKT for Gannett, Andy Dorias ran from the Elkhart T.H. to the summit and back in 12h45m55s on August 26, 2011. See below. While slightly slower than Bakwin's FKT, this is the fastest time for the longer (42 miles?) Elkhart - Titicomb Basin - Dinwoody Pass - Gooseneck Glacier route. Dorias' ascent time of 6h30m is an overall ascent record for the peak. His trip report is here. Courtney Pace reports below doing Gannett via Wells Creek in a speedy 11h14m20s car-to-car (5h43m ascent), September 20, 2014. Going late in the season, Pace was able to jump across Wells Creek, rather than doing the sketchy solo. This last August I ran/hiked/scrambled Gannett from the Elkhart Park TH and made it to the summit in 6 hrs and 30 min after talking with my pops (who was camping in Titcomb Basin for 5-10 min) and chatting with a guided party at the base of the Gooseneck. Total round trip time was 12:45:55. I wasn't aware of the actual record time but that's irrelevant anyway since your run was from a different TH. Maybe a record from Elkhart? Here's Krupicka's brief report on his FKT on Gannett. He should have a more detailed report with photos on his blog soon. "Started from the GRL trailhead at 7:20am yesterday morning and returned at 4:06pm for an 8:46:32 car-to-car time. It took me 4:45:39 to get to the summit (which was actually about 30min longer than I anticipated...boulder hopping takes some time and I forgot to factor in the drop to Scott Lake), I spent 4:20 on the summit taking pics, etc. and left at exactly 4:50. The run down/out took me 3:56:32 then. I ended up not taking any traction or an axe. I could've gotten away with never stepping on snow/ice, but the glacier itself was quite low-angle and had some crunchy firnspiegle-type ice on top, so it wasn't much of an issue traction-wise. I wore LS X Country shoes, shorts, sunglasses and BUFF. Carried a 3oz jacket, glove liners (wore these until I started the climb up Tourist Creek), 12 gels, one 13oz bottle, and a camera (with a photo of the map on it). Perfect set-up. I was happy for the sticky rubber on the endless boulder-hopping (which I actually really enjoy) and the ~1000' of 4th Class-ish slab that I climbed to the summit on the climber's righthand side of the couloir. Descended the scree and talus in the couloir on the way down. Suffice it to say that--of the over 100 peaks I've summited this summer--I was sufficiently impressed with the landscape and the long approach that this was the first summit register I've signed all summer!" Unreal achievement. Congrats Tony K.! Was able to do 'leap of faith' at the cleft rather than the scary solo I did a few years back. Only doable late in the year. Encountered fresh snow on the 5th class to gain summit ridge. I knew there was no chance I was going to come close to Tony's time. But I thought I would be close to yours. Took approach shoes strapped to my bag and switched out after the trail portion. Was glad to have both pairs. Incredible route! Very cool! I always speculated that a person could jump across the creek late enough in the season. The trick is to get there when the water is low but before there has been a lot of snow. You nailed it! hey! I was curious if any of ya'll know anything about Gannett being done in a day by a woman? I'd love to make it happen some day.